The Asus Zenbook UX305LA is a sleek and light-weighted notebook along with Broadwell U hardware, an IPS display, extended battery life and a spirited price. With all these qualities, Zenbook is one of the better 13-inch notebooks in the market at the moment. Having said that not having a backlit keyboard, the narrow IO and the lack of touchscreen option could direct you in an opposite direction. 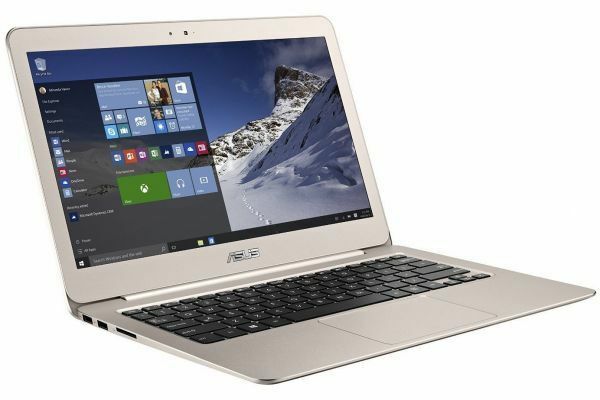 The Asus Zenbook UX305LA is a much simpler model that the company previous ultrabook. Where the previous Zenbook features an outline of concentric loops on the cover, the new Zenbook have a plain metallic hood that looks a lot like Apple Macbook Air. The only thing which set aside is the glossy logo. The Zenbook have what company described Aurora Metallic Version, although Asus will also come up with a dimmer color variant called Obsidian, which will have rippled pattern. The hood, the belly, and the interior are compactly made out of aluminum. As a matter of fact, the only plastic constituent is the bezel around the display. The screen is edged by a thin layer of protective rubber, which ensures that the display doesn’t touch the laptop’s body when it is closed. The interior framework is made out of meta as well, so it is sure that the UX303LA is tough and durable. Of course, there are some flaws on the cover and the keyboard area, but nothing big that is worth mentioning. The screen is seized by an elongated stretched hinge across the length of the laptop same as in Zenbook. The hinge is solid, and it will keep the display in any position users will locate it, which shows that the company has advanced the overall mechanism. We can only expect that it is reliable too as the users seemed to complain about the weak hinge on the previous version. On the back edge of the laptop is two little plastic feet, which lift the laptop when you open the display beyond 90 degrees. It will be somewhat tricky to keep the laptop in place on the table, particularly in a glossy one. Given that it comes with a Bradwell U platform, a fan, and improved ventilation are required. To fulfill this requirement, it installed some vents on the belly, to go together with those under the hinge. Apart from that, the UX305LA have the similar design as UX305FA. And for the IO, it has 3 x USB 3.0 slots, a card reader and a micro–HDMI, though it would be better if it could fit in a full-sized HDMI port. The DCIN is located on the right rim. The screen is superb. The color calibration of Greens, Blues and particularly White points are defiantly an innovative idea. Although the color calibration should be incorporated by default, because the panel is really impressive and Asus should take benefit from it. Aside from that, it has a pretty good brightness, viewing angles, contrast. However, the disappointing thing is that it doesn’t offer touch, and the company has no plans to offer one. The screen does have a limited opening angle, as it only bends over about 130 degrees, which could be a difficulty when used anywhere except the desk. 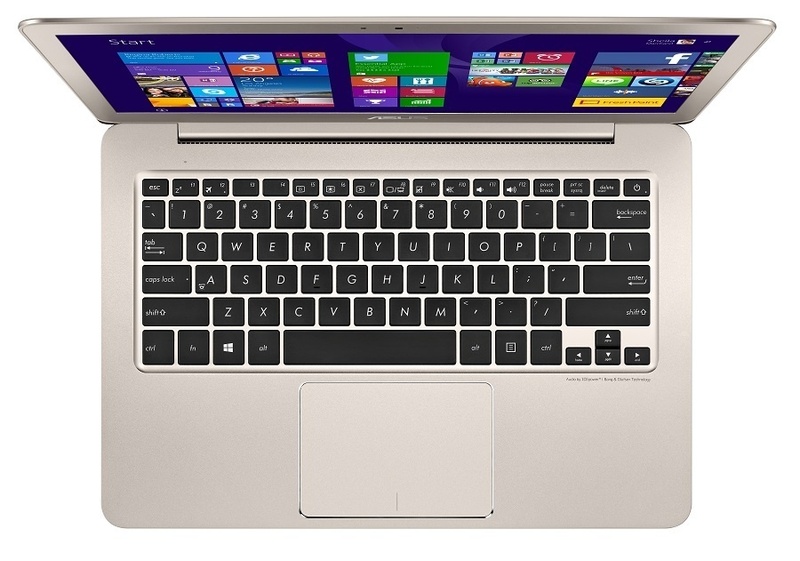 Asus Zenbook UX305LA keyboard is similar to the UX305FA. It is fine for a thin and a light computer. The keys go deep into the frame and mostly feel reactive and stiff. Although they don’t have an official click reaction, so you can’t precisely confirm whether the click has been duly registered or not. It could have an adverse impact on users typing speed. But the major drawback is the keyboard is not backlit. The black keys on a silver backdrop are quite noticeable, but in a poor lighting, it is not going to be much helpful. Users have been complaining about the lack of backlit keyboard in the previous model, and much more are going to complain about it in this model. The trackpad is properly sized and even. It is quite precise and records taps and gesture fine. The surface, however, is rigid and clunky. Since this is a TouchPad, it doesn’t give any room for modification. So you cannot regulate the curser’s speed or response. In conclusion, the keyboard is fine for the everyday users, but people who type for their living might go in a different direction. As previously mentioned, the laptop comes with Intel Broadwell U hardware. It runs on an Intel Core i5-5200U processor along with an 8GB RAM and a 128GB SSD. It is an ideal pattern for a standard user. The company will offer Core i3c and i7 processor with an option of just 4GB RAM and extended SSD storage. For a normal user, an i5 processor would be sufficient. The version with 4GB RAM is not good, as the memory is fused on the motherboard and cannot be upgraded, so you will have to manage whatever you get from the start. However, the storage comes with an upgrade, and it uses standard M.2 SATA3 80 mm stick. The laptop is good for everyday use, it boots quickly, recommences from sleep in just one second and manage to handle all the basic tasks effortlessly like watching videos, playing games and browsing. Regarding software, it has a Windows 8.1 and a few preinstalled applications. However, you should erase all the pre-installed applications and trails, and is Microsoft is selling this in the country try to get their signature edition variant which has no bloatware. The speakers of the laptop are good. Placed on the belly, there are two speakers, one towards the left edge and other on the right. While they do not drive out an amazing sound quality, they are loud and don’t deform at high frequency. For connectivity, there is LAN, Wi-Fi, and Bluetooth. It uses the Intel 7265 dual-band wireless AC element, which is pretty good. On the top of the screen, there is a webcam, it is decent for Skype calls, using at poor light causes noisy images. The company offers a 56Wh battery, which is bigger than the previous models. The battery can provide about 6-10 hours of daily use on a single charge which is not bad. The Asus Zenbook UX305LA was first released in Europe in July, and until now it has only reached the US. The laptop is priced between 800 to 1200 EUR. Overall the Zenbook is a good laptop. It is a good buy if you look at the cost. It is nicely put up, strong and fast. Battery capacity is relatively nice. The drawback is the keyboard and screen, which might make the users go for something else. Where many users will welcome the matte display finishing, many will complain about the lack of touch. But apart from that this laptop is a right call.